The Song That Made You Visit. Everyone knows that Portofino is beautiful and that it has a picturesque harbor where the rich and famous moor their yachts. 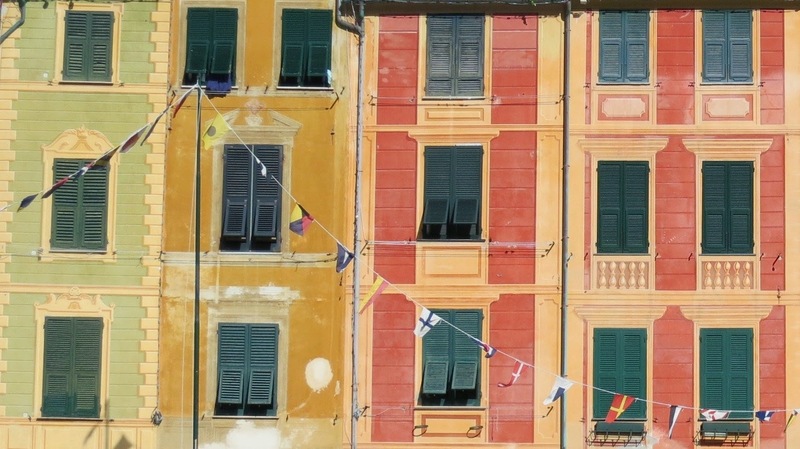 Who can't conjure the image of Portofino's waterfront arc of tall, colorful Ligurian buildings? But what visitor thinks about how a little town with fewer than 500 residents became so famous? Why is Portofino so incredibly popular when it's tiny, beachless, expensive, and visited mostly in day trips? Fishing Village to Iconic Village Portofino's fame started slowly when the only access was by boat or mule track. An Englishman with the prescient nickname of 'Twitters', Lord Henry Herbert, visited the town in 1870, and decided to build a villa above the town, 'L'Altachiara'. Early publicity in the form of a poem came from de Maupassant in 1888, which coincided with the opening of a road to Santa Margherita. In the decades following, Portofino slowly became known to the aristocratic, and by the 1920's well-heeled British and German vacationers were visiting in numbers. Portofino was prominent enough by 1935 that the Province of Genoa provided architectural protection, thus preserving the historic port frontage we all know so well. By the 1950's, after a visit by the Duke & Duchess of Windsor, Hollywood movie stars began to visit and the tipping point was one song away. 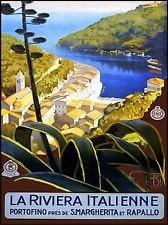 Portofino's mass appeal really exploded in 1958 with the release of a pop song, an immensely popular song, Love in Portofino. 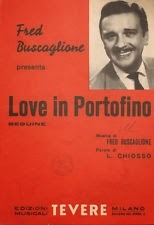 It was first sung by Fred Buscaglione, who co-wrote it with Leo Chiasso. Written while they enjoyed the crescent-shaped beach at nearby Paraggi, Buscaglione's version sold 160,000 records. In 1959, it was released by Italian crooner Johnny Dorelli, and then by an amazing French singer with the stage name, Dalida. Portofino went viral, as they say, and the icon was here to stay. 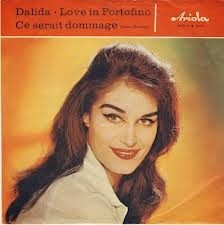 Dalida, Love In Portofino 45rpm. Dalida Born as Iolanda Gigliotti of Italian parents in Egypt, she was a big star and is still the 6th best selling singer of all time! In her career, she recorded songs in ten different languages. Even though she died in 1987, she is still very popular and has been remixed extensively, including as a disco queen. Her You Tube videos have been seen over 1.5 billion times. You really really should watch this one where Dalida enchants Italy in three languages on RAI: Dalida: Love In Portofino (1959). Who could resist her with such romantic lyrics. The song appeared as television was becoming the dominant entertainment, as Italy's economy was in the midst of the 'Italian Economic Miracle', and as transatlantic jet travel was beginning. It acted as a magnet drawing European and American tourists to a new icon suited for the times - Portofino. The impact of one song on one village may seem almost quaint now that mass travel is an accepted cultural fact, and we brandish or endure lists of crowded places designated 'Must See'; when we overlook the oxymoron of hiking fees in villages that are 'Off the Beaten Track'; when we are not appalled that Universal Studios has re-created Portofino in Florida. Since image and reality have become indistinguishable, it is natural that Andrea Bocelli would use the entire little fishing village as a televised theater, and sing – what else – Love In Portofino. Watch Bocelli In Portofino (3+ min.). Whatever any of us think of mass travel and its icons, one thing is sure - we still want to visit Portofino. A Beautiful Seaside Walk Along the Portofino Coast .